I noticed this recipe when looking for a chunky tomato topping for fish. 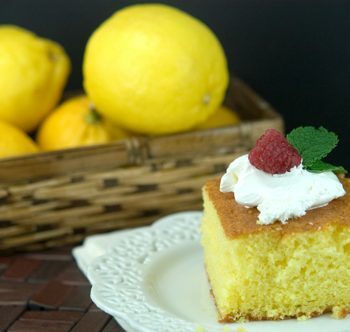 Them I came to this recipe on The Comfort of Cooking and being the lemon freak that I am, I just had to try it. This recipe is well worth making. Light, healthy, tasty and easy to make. What more can you ask for? Bring water and bouillon to a boil in a pot over high heat. Add orzo and cook according to package, about 9 minutes, or until al dente. Drain, set aside. In a large skillet over medium-high heat, add olive oil. Wait for the skillet to heat up a bit. Add zucchini, cherry tomatoes, shallot and garlic. Sauté for about 5-7 minutes, or until the zucchini is tender. Remove from heat and add thyme, lemon zest, lemon juice, salt and pepper, stirring well. 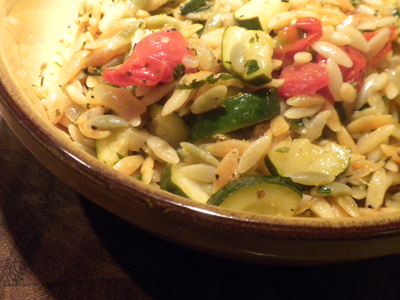 Then toss with orzo until well combined. Serve immediately.